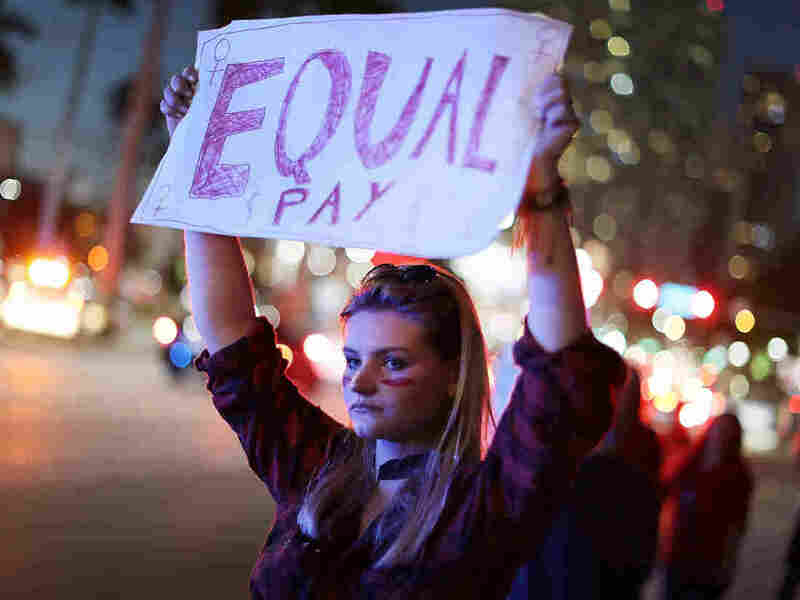 #MeToo Raises Profile of Pay Equity Among Policymakers And Courts After #MeToo, many employment attorneys say they've seen the number of pay-disparity cases spike, and employers are having to adapt by conducting investigations and pay audits. Clarissa Horsfall joins with others during "A Day Without A Woman" demonstration on March 8, 2017, in Miami. Employment attorneys say they've seen a spike in pay-disparity cases. Just this week, a federal judge ordered the Trump administration to reinstate rules requiring large employers to submit data to the U.S. government about what they pay their workers, broken down by gender and race. U.S. District Judge Tanya Chutkan in Washington, D.C., said the administration violated the law when it scrapped Obama-era rules before they took effect. Her ruling was hailed as a victory by worker advocates, who say the reporting requirements will make pay more transparent and encourage employers to compensate their workers equitably. Businesses, meanwhile, are scrambling to figure out whether the administration will appeal the ruling or whether they will have to file this information by the end of May. Attorneys in employment cases say that new information could lead to more lawsuits alleging pay discrimination. "We've seen a really renewed focus on cases," inspired in part by the #MeToo movement, says Cheryl Behymer, a South Carolina attorney who represents employers. Pay equity is getting a lot of legal and political scrutiny. High-profile actresses talked openly about sexual harassment as well as pay discrepancies, and Behymer says many women in other industries — especially in technology, finance, media and accounting — are doing the same. The laws themselves have also been changing. The Lilly Ledbetter Fair Pay Act of 2009 gave workers more time to file complaints. And in recent years, many state and local governments have passed measures strengthening their equal pay laws. For example, 13 states, 11 municipalities and many businesses no longer permit employers to ask for a job candidate's salary history, arguing that perpetuates pay discrepancies. It is not yet clear whether more complaints are being filed at the federal level. The latest data from the Equal Employment Opportunity Commission, which enforces workplace civil rights laws, is from 2017 — prior to much of the #MeToo movement. In previous years, the number of complaints did not vary much annually. The attention is prompting many large employers to conduct pay audits and correct any discrepancies, says Jason Habinsky, a New York employment attorney. "It's on several different fronts," he says. "Fortunately, the majority of employers want to do the right thing." Habinsky says employers should conduct audits to gauge whether there are discrepancies in pay. Often, he says, audits will reveal inequalities. "Then the question becomes: Are these disparities based upon legitimate reasons or are these disparities based upon historical inequalities or decision makers making poor decisions?" Habinsky says. Most often, he says, his clients will fix those problems by paying the underpaid workers more. Some states, including Oregon and Massachusetts, are encouraging employers to do conduct pay audits by limiting the liability for companies that undertake them and take steps to remedy any problems. Allowing the EEOC to collect pay data from employers will further pressure employers to pay attention to their pay disparities, says Maya Raghu, director of workplace equality for the National Women's Law Center, which successfully brought the lawsuit challenging the Trump administration's rule change. "Requiring these large employers to collect and report that pay data to the EEOC, it creates incentives for companies to do some analysis," and to take corrective steps, Raghu says. It will also help workers get basic data about who is paid what, she says. "One of the issues with pay discrimination is that it's really hard to detect" because workers are discouraged or barred from discussing pay with colleagues or because they simply aren't aware. The National Women's Law Center administers the Time's Up Legal Defense Fund, which helps women bring sexual harassment complaints. Raghu says the fund has received more than 4,000 harassment claims so far, and many of these include complaints about compensation as well. A lot of times, she says, women allege their pay or hours were slashed after bringing sexual harassment complaints.